The interesting news here is not that Ultra Chloraseptic, the brand behind the popular anaesthetic throat spray, is advertising, we quote “only when temperatures have dropped to a level likely to cause an increase in winter-related sore throats, colds and flus” (that’s old-hat and quite common these days) but that this is the FIRST TIME that Ultra Chloraseptic has chosen Out-of-Home as part of its strategy to target audiences. Tim Last, Head of Innovation and Tech at Exterion Media, did say “It’s fantastic to see brands like Ultra Chloraseptic capitalising on our intelligent and optimal media solutions including our digital dynamic, thermal activation technology. 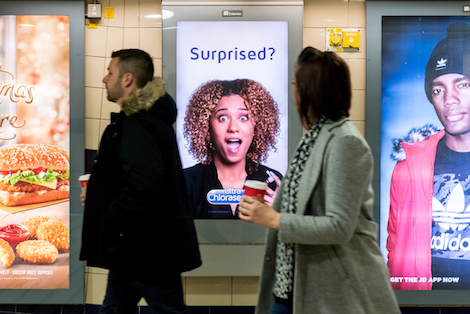 It’s campaigns like this that showcase the unique potential of Out-of-Home to deliver contextual, useful and tactical campaigns that effectively reach consumers in the right place and at exactly the right time”. The campaign was planned and booked by MediaCom Edinburgh and Kinetic. This entry was posted on Thursday, December 15th, 2016 at 08:16 @386 and is filed under DailyDOOH Update. You can follow any responses to this entry through the RSS 2.0 feed. You can leave a response, or trackback from your own site.